Len Doyal FRSA FRSocMed is emeritus professor of medical ethics at Queen Mary, University of London and a medical ethicist. He was born in Atlanta, Georgia in 1944 and studied philosophy and sociology at Georgia State University, earning his undergraduate degree in 1966. Jeffrey S. Tobias is the editor of Informed Consent in Medical Research, published by Wiley. The Nuremberg Code and the Helsinki Declaration. Human guinea pigs and the ethics of experimentation. Henry K Beecher and Marice Pappworth: Character in the development of modern research ethics. Extracts from Pappwroth and Beecher. Learning from unethical research: some recent scandals. Psychological support for patients undergoing breast cancer surgery. Evaluation of a stroke family care worker. Does HIV status influence the outcome of patients admitted to a surgical intensive care unit?. Letters from BMJ relating to the above articles. Thrombolytic treatment for acute ischaemic stroke. 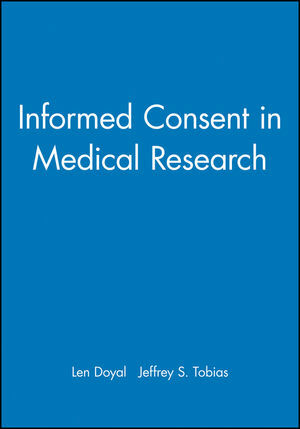 Regulating informed consent within medical research. Medical research and the competent adult. Human reproduction and assisted conception. Issue in HIV and STDs. Clinical trials, informed consent, and the boundaries of therapeutic discretion. Rights and responsiblities of the individual. The role of the effective communication in obtaining informed consent.